Ravissante maison de campagne offrant un logement pour des vacances indépendantes en famille ou entre amis. Située dans un cadre paisible et pittoresque avec de nombreuses activités disponibles sur place. Usage exclusif de la grange de jeux adjacente. Jolies marches dans les collines en hiver, une piste privée de ski / luge pour les enfants sur la colline de la propriété. Une sympathique maison de vacances familiales toute l'année. Salle d'eau du rez-de-chaussée avec douche et WC, en haut, une salle de bains avec toilettes, baignoire et douche et salle de bains attenante à la chambre double. Cuisine avec comptoir petit-déjeuner, cuisinière, plaque de cuisson, lave-vaisselle et réfrigérateur/congélateur et micro-onde. Une notation en or nous a été attribuée par le Green Tourism Business Scheme pour notre logement de vacances respectueux de l'environnement. Super house. Excellent facilities. Layout works very well for socialising. Recently had a fantastic pre Christmas family get together at Holly House. Perthshire was a good meeting point for family spread across the country. The surrounding countryside is beautiful and great for walks. The small towns nearby are lovely to wander round (Christmas lights were a bonus) and Perth or Dundee are easily reached. Being December though we spent quite a lot of time indoors cosying up at the log burner playing games and catching up. The layout of the kitchen and dining/sitting areas are perfect for this. The bedrooms are all very comfortable and there are enough bath/shower rooms to prevent long queues when there are potentially 9 people. All in all ideal for our needs. I would highly recommend HH as a holiday home for either short breaks or a couple of weeks. Amazing place for kids to run and play and adults to breath. While the property itself is remarkable the kindness and attention to detail of the owners was the most impressive aspect. Can’t wait to return. A lovely welcome from Alastair and Diane. The house was very spacious, comfortable and warm. Had a fantastic snowy week! Great location for exploring the Cairngorms. Would thoroughly recommend. Lovely, welcoming holiday home perfect for large families/groups. Owners were very helpful and accommodating. Our little 2 year old was amused for hours with all the toys and books that were made available (which was much appreciated!!). Lovely open plan home from home which was warm and comfortable. Highly recommend and would go there again in a heartbeat. Our stay in Holly House was excellent. There was plenty of space, a superb back garden, wonderful layout, and very child and dog friendly. The kitchen was stocked with most of the things we needed to cook most of our meals with, and the house is situated in such a superb location, we were easily able to find plenty to do. Our only concern was with the bed in the master bedroom, the bottom bunk bed, and the single bed downstairs. The mattresses were very uncomfortable; we could feel the springs through the top of the mattresses. It might be worth considering replacing these? Thank you very much for such an enjoyable weekend. 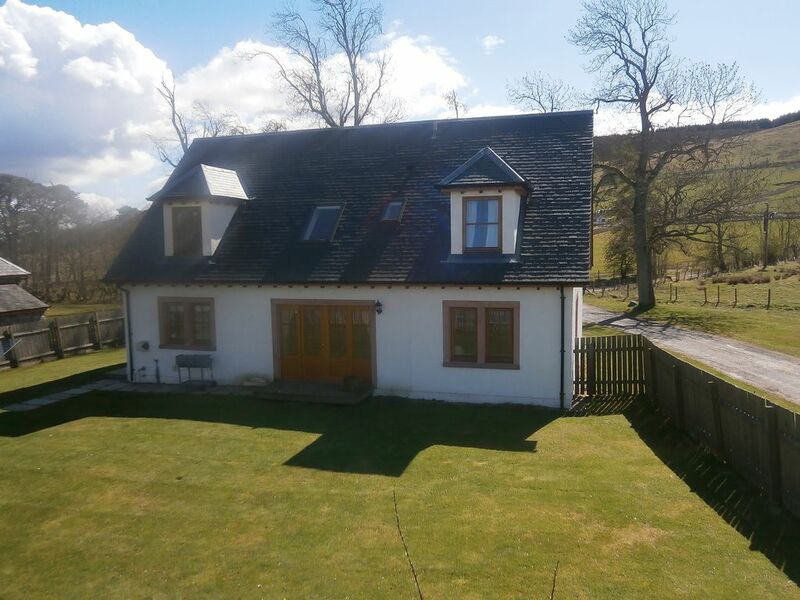 Beautiful house, with stunning views, it has all you need for a family. My 18month old grandson had a wonderful time especially playing with all the toys and tractors in the garden. Lovely welcome from The Ramsay's with freshly baked Lemon drizzle loaf waiting for us. Would recommend and stay again. Magasin locaux à Alyth, boulangeries, Royal Bank of Scotland, petit supermarché, marchands de journaux, boucherie, 3 commerces de restauration à emporter, 3 cafés et 2 restaurants. Emplacement idéal pour les randonneurs, les promeneurs, les cyclistes, les golfeurs, les pêcheurs et les skieurs. Booking Notes: Booking through the owners either email enquiry or telephone. Payment terms 20% deposit on booking. Full payment 8 weeks prior to holiday. £100 damage deposit. Changeover Day: Week stays arrival Saturdays 3pm. Departure Saturday 10am. Short breaks available (Friday to Monday).